"I remember watching a cooking show and hearing of this awesome Irish meal, and so I changed it to fit my own needs and likes/dislikes. I love it and my boyfriend gets very excited when we get to make this dish! It's not only easy, but it's great as a leftover too! Garlic-flavored chicken broth works very well in this recipe." Place the potatoes into a large pot and cover with salted water. Bring to a boil, then reduce heat to medium-low, cover, and simmer until tender, about 20 minutes. Drain and allow to steam dry for a minute or two. While potatoes are boiling, place cabbage into a pot with about an inch of water, bring to a boil, cover, and simmer the cabbage until tender, 10 to 15 minutes. Drain the cabbage, and set aside. In a large bowl, mash the potatoes and mayonnaise together, adding chicken broth by the tablespoon until you reach your desired consistency. Season the mashed potatoes with salt and pepper. Stir the cabbage into the mashed potatoes. Place the cooked ham into a skillet over medium-low heat, and cook and stir until the ham is hot, about 3 minutes. 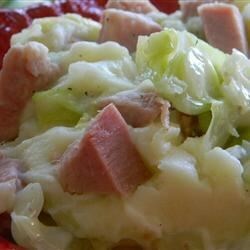 Stir the cooked ham into the colcannon, and serve. This was fast, easy & very good! I wanted a traditional Irish meal for St. Patrick's Day & I found it with this! What a unique recipe! I will be making this again! I added a beaten egg and made this in the oven as someone suggested. Then proceeded to eat it for every meal for three days and miss it when it was finished. THIS WAS AWESOME! Simple but good. I reduced the prep time by boiling the potato with the cabbage.